Cutting-edge design of corporate headquarters office buildings has changed drastically in the financial services industry. Banks, credit unions and other financial firms want centralized facilities large enough to accommodate decades of growth. They want offices with expansive interiors and lots of sunlight. They want signature looks that convey warmth to customers and excitement to would-be recruits. Of course, they also want to save money and time on construction. That’s the story of DATCU Credit Union’s new, $15 million administration building in Corinth, TX. It was built for a savings in 18 months. Besides saving money, the CFS trusses also saved time on the project. They were pre-fabricated. Each truss member component was made on computer-driven roll formers, which cut weeks off the delivery and installation schedules for the roof assembly. 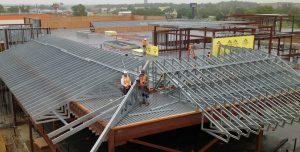 Julio Saenz, Project Supervisor at Marek Brothers Systems Inc., Dallas, TX, says his four-man crew installed the DATCU trusses quickly, saving five to six weeks on the truss installation. Saenz says the speediness of the truss installation saved close to 40 percent on labor.